The development of Southern Nevada is intertwined with the history of the Church of Latter Day Saints. In 1855, Mormon settlers were the first to colonize Southern Nevada with the construction of a small adobe fort in a place known as Las Vegas (Spanish for “the meadows”). Church leaders had mapped a trail between Salt Lake City and California, and believed Las Vegas served as a good rest stop along the way. However, because of its remoteness and other factors, the Las Vegas mission failed after only three years. Around that same time, Mormon colonists also settled in Callville on the Colorado River as well as along the Muddy and Virgin Rivers, in areas, which seemed to have agricultural promise. For the most part, these farming colonies were unsuccessful and, by 1870, most had been abandoned. In the late 1870s and 1880s, a second wave of Mormon settlers journeyed to Nevada to establish communities in Mesquite, Logandale and Bunkerville. The latter, located about 90 miles east of Las Vegas via Interstate 15 and State Route 170, was one of the most unusual and unique of the colonies. 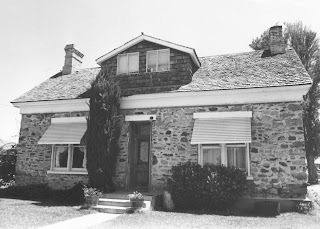 Founded in January 1877, Bunkerville was originally settled by followers of the United Order of Enoch, an offshoot of the main Mormon church that espoused a communal lifestyle. Town founder and namesake, Edward Bunker, settled on the south bank of the Virgin River with 27 relatives and friends, and set about to create a community in which residents would share equipment, property and work. The colonists immediately set out to tame the Virgin River, attempting to build an earthen dam and irrigation canal. Within a few months, alfalfa, corn, cotton, grapes and vegetables had been planted. A flash flood destroyed the dam in August 1877 but it was rebuilt in time to save that year's crops. Life in early Bunkerville was difficult. The river refused to stay controlled, the soil was alkaline, the water was awful and there was dissension among the colonists over the division of labor and crops. By 1881, the United Order was abandoned and the land was parceled to individual families. Farming proved viable, despite the hardships, and the area developed into a reasonably productive agricultural district, which it remains to this day. In addition to the difficulties in developing an agricultural base, other problems cropped up because many of Bunkerville's founders were polygamists, which was acceptable in the Mormon religion but illegal. During the early years, town fathers were frequently forced to hide from federal marshals, who would periodically raid the town looking for offenders. Things finally quieted down after 1890, when church president Wilford Woodruff banned the practice of multiple wives. Over the years, more substantial homes were built in Bunkerville. Perhaps the most impressive is the two-story red brick Edward Bunker house. Still standing, the home boasts a two large porches, a pair of fireplaces and fine classic frontier architectural lines. Driving through Bunkerville, you can find other glimpses into the hamlet's past. Just south of the Bunker home (the largest house in the historic district) is an abandoned (but apparently maintained) one-story brick Victorian home. Adjacent, you can find the remains of a smaller stone house, while down the street are other historic homes. A pioneer cemetery at the edge of town contains monuments to the town's founders, including Edward Bunker. State Route 170 is a loop road that runs parallel to I-15 for about 12 miles, between Mesquite and Exit #112. This is a pleasant short drive that runs next to the Virgin River (which still looks pretty brackish) and neat rows of crops. Additionally, the area is home to a number of small dairy farms. For more information about Bunkerville, contact the Virgin Valley Heritage Museum in nearby Mesquite, 702-346-5705. While most Nevada mining towns seem to be located in the more remote parts of the state, there is one, Olinghouse, that developed just east of the Truckee Meadows. Historic records indicate that this little known mining camp, located in Pah Rah Range, between Reno and Pyramid Lake, even advertised itself as “The Biggest Little Gold Camp in Nevada”—an obvious play on Reno’s famous slogan. 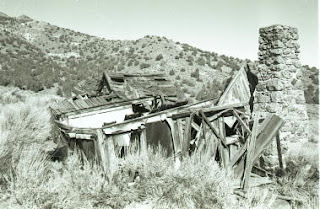 The remains of Olinghouse are located 9 miles northwest of the community of Wadsworth, which is located about 20 miles east of Reno. To reach it, head north on Nevada State Route 447 for 2 miles, then turn west on an unmarked but maintained dirt road. The site of Olinghouse is located about 7 miles from the turnoff. While Olinghouse never grew very large, it produced sufficient ore to support nearly continuous mining from the mid-19th century to the present. The area’s earliest mining visitors were itinerant prospectors who had spread out from Virginia City in the hope of discovering the next Comstock Lode. A few of the miners headed north toward the Black Rock Desert, uncovering occasional small veins and other traces of minerals throughout the Pah Rah range. Prospecting continued sporadically for the next four decades, with the first significant activity beginning in about 1897, following the discovery of gold in White Horse Canyon, three miles north of Olinghouse. Despite the gold strike, the larger mining companies remained skeptical about the district’s potential, leaving it to a hundred or so independent miners, who were able to recover a few dollars a day working the veins. A post office was opened in 1898 and a small business district developed over the next decade, which included saloons, restaurants and lodging houses. The town also acquired its name during this time. Elias Olinghouse was a Wadsworth cattle rancher, who had a large summer ranch operation in the eastern Pah Rah range. While the town was first named, "Ora," it later took Olinghouse’s name, since he had claim on most of the land in the area. In 1907, the town of Olinghouse’s fortunes began to look up, as investors seeking to repeat the mining successes at Tonopah and Goldfield, began pouring money into almost any Nevada mining camp that showed promise. Several mills were built, including one just north of Wadsworth, and a rail line was constructed to connect the mines to the mill. Within the year, however, the boom was over (with the investors making very little money) and the mining activity at Olinghouse diminished. The mill and railroad were dismantled and, once again, only a few dozen miners worked the area, making just enough money to survive but never enough to get rich. Today, visitors will find a string of modest wooden cabins and homes, most still inhabited, some interesting mill ruins, a few old mine shafts, an abandoned ranch house and, to the north, a modern open pit gold mining operation, which opened in the mid-1980s. As you first reach the site, you will find the collapsed wooden walls of an old miner's shack, on your left. After passing a few of the inhabited homes, you reach the dilapidated remains of what appears to have been a small milling operation. Climbing up the hill behind the crumbled wooden mill site, you can find an intriguing mine shaft, which has several skeletal wooden walls surrounding the entrance and a fallout shelter sign. A little farther west from the center of the community, you can find the stone remains of a larger mill site, including some wooden supports and other ruins. Another half mile or so, you find an interesting abandoned brick and wood farmhouse, standing alone in a field of sagebrush and weeds. In the end, Olinghouse is just another of the hundreds of mining camps that took seed, blossomed for a time, and were slowly reclaimed by the uncaring Nevada desert. An informative guide booklet about Olinghouse is John Townley’s “Olinghouse Mining District,” which was published in 1985 and can still be found in some local libraries. 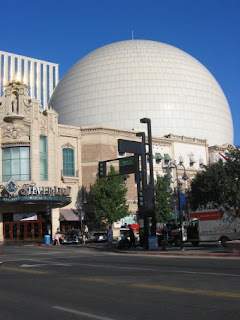 Several years ago, Reno gained two big balls. In 1995, the Silver Legacy Resort was constructed, which has a giant round dome as its centerpiece, and the National Bowling Stadium opened, which is topped by a big, round domed theater. So, what’s inside the big balls? At the Silver Legacy, the 180-foot dome contains a 120-foot, green, faux mining machine with lots of pulleys and giant wheels. About once an hour, the interior of the dome darkens, the massive wheels and belts on the device begin to pump and churn and there’s a lot of noise. Nothing actually happens but people stand around and admire the big Rube Goldberg-like beauty of the contraption, which gives them a respite from playing the omnipresent slot machines. 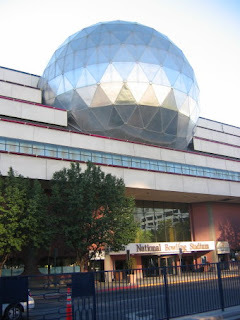 The National Bowling Stadium’s four-story globe houses a 172-seat I-WERKS theater (like an IMAX). This theater in the round—designed to resemble a bowling ball—shows 70-millimeter films and boasts six-channel digital surround sound. Of course, the National Bowling Stadium itself is somewhat unusual. Called the “Taj Majal of Tenpins,” it’s one of the world’s largest facilities devoted solely to bowling. The $42 million stadium has 78 bowling lanes, a C.A.T.S. Practice Lane (Computer Aided Tracking System, which analyzes bowler’s games), sky boxes, pro shops, restaurant, sports bar and seating for 1,000 spectators. The facility is restricted to tournament play (no local bowling allowed) and regularly hosts events sponsored by the United States Bowling Congress, the National Bowling Association and other groups. Every time the Sierra Nevada range is covered with inviting slopes of groomed, packed snow, local skiers should fall to their knees and give thanks to a man named Jon Torsteinson Rui. Rui, who is better known by the name, John “Snowshoe” Thompson, introduced skiing to Northern California and Nevada. Prior to his arrival in the region in the mid-1850s, no one had ever strapped on a pair of thin, wooden boards and slid down a hill. Thompson was born in Norway in 1827. His family immigrated to America when he was ten years old and settled in the Midwest. In 1851, however, John joined the thousands of people heading to California to search for gold. After several fruitless years of mining in the Sierra range, he settled in the Sacramento area to farm. He heard about a lucrative postal service contract to carry mail from Placerville, California, to Genoa, a tiny hamlet in what was then the Utah Territory. Having skied as a child in Norway, he also had a plan for how to carry the mail—he would create a pair of long, wooden skis, which were called snowshoes at that time. He applied for the job using the name, John A. Thompson, because he felt his real name was unpronounceable to non-Norwegians. Worried he wouldn't be hired unless he proved himself eager to work, he showed up carrying his pair of handmade, 25-pound oak skis, which were ten feet long and an inch-and-a-half thick. History doesn't tell us if he impressed the postmaster, but he got the job, mostly because he was the only applicant. Thompson made his first trip (it was 90 miles each way) over the mountains on January 3, 1856. He took three days to reach Placerville and made the return trip in an amazing 48 hours. Word of his accomplishment spread and within a short time, Thompson became a Nevada legend. Most incredible was the fact that Thompson often carried a pack loaded with 80 to 100 pounds of mail and assorted packages (he even carried, over several trips, much of the machinery and printing equipment used to produce Virginia City's famous Territorial Enterprise newspaper). According to Lake Tahoe weather historian Mark McLaughlin, one of Nevada’s most important mining discoveries owes much to Thompson. In June of 1859, Thompson was given an ore sample by two miners, Peter O’Riley and Pat McLaughlin, who wanted it assayed in Placerville. Thompson carried the bluish rock to Professor W. Frank Stewart, a Placerville geologist, who analyzed it and declared that it contained some of the richest silver content he’d ever seen. Stewart asked Thompson to take the sample to Sacramento for additional analysis. The second assay supported Stewart’s conclusions. The two miners had discovered the fabulous Comstock Lode in Virginia City. For nearly two decades, Thompson delivered the mail in small towns throughout the Sierra and gave additional meaning to the popular motto about mailmen making their rounds regardless of rain or sleet or snow. Interestingly, Thompson was rarely paid for his services. In 1874, he petitioned the U.S. Congress for back pay but was turned down, despite traveling all the way to Washington D.C. to make his appeal. Over the years, Thompson also shared his knowledge about using his “Norwegian snowshoes.” Along the way, he taught dozens of people how to ski and is generally responsible for introducing the sport to the region. 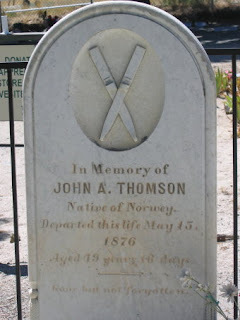 Thompson died in 1876 and is buried in the quiet Genoa cemetery, which is located 15 miles southwest of Carson City via U.S. 395 and Jack’s Valley Road. The gravesite is located at the rear of the cemetery, under large shade trees. Today, visitors can pay their respects to the father of Sierra Nevada skiing and view his tombstone, which, not surprisingly, has the image of a pair of wooden skies carved into its white marble. There’s nothing like seeing how rich people live. Exploring a huge mansion or the grounds of a sprawling estate built by a wealthy person offers a vicarious thrill, especially for those of us unlikely to ever live in such a manner. The Tallac Historic Site at Lake Tahoe is such a place. There, it’s possible to catch a glimpse of the lifestyles of the rich and famous in the late 19th and early 20th centuries. The Tallac homes—really elaborate summer cottages—were built by some of America’s wealthiest individuals. At one time, the site was also the location of Tahoe’s first casino-hotel. While many of the structures have disappeared over the years—victims of neglect and progress—a few have been preserved and are now managed by the U.S. Forest Service. The Tallac Historic Site is located on Route 89, north of Camp Richardson. A wonderfully scenic two-and-a-half-mile-long bicycle and hiking path winds through the area. Riding through the historic grounds is an opportunity to pretend that you’ve gone back to a time before automobiles and airplanes, when only the super-rich could afford to build seasonal homes in a once remote place, such as Lake Tahoe. The setting is remarkably peaceful and very beautiful. 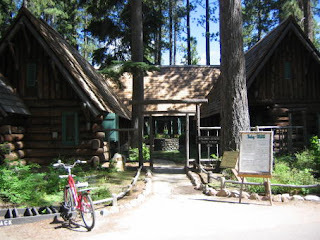 The trail is lined with tall pine trees filled with chattering birds and, as you ride along, provides glimpses of the clear, blue waters of the lake. While the main path is paved, there are several dirt tributaries that snake through the reserve and lead to small, hidden beaches or particularly scenic tree groves. Development of the Tallac area started in the 1870s, when Yank Clement opened the Tallac Point House on the south shore to accommodate visitors. “Yank’s” inn also offered steamboat rides, a saloon and dancing. In 1880, "Yank's" was sold to Elias "Lucky" Baldwin, a California entrepreneur and professional gambler. Baldwin transformed the sleepy lakeside inn into a 250-room resort that included a casino, ballroom, four bowling alleys, sun parlors and billiards rooms. Meanwhile, in 1894, George Tallant, son of one of the founders of California’s Crocker Bank, built a rustic summer lodge adjacent to the Baldwin estate. Five years later, Tallant’s sold his property to millionaire Lloyd Tevis, who expanded and renovated the home, making it the largest and most luxurious in the area. Tevis added servants quarters, a dairy, stables and a shaded, garden with Japanese teahouse and arched bridges. In 1923, Tevis sold the compound to George Pope Jr., a San Francisco lumber and shipping magnate. To reflect Pope’s ecumenical name, the estate was nicknamed the "Vatican Lodge." Also in 1923, another prominent businessman, Walter Heller purchased the land south of the Pope estate. Heller began construction of what would become the last great Tallac mansion, an impressive stone and wood lodge named Valhalla, which is now used for concerts and special events. The early 1920s marked the heyday of the magnificent Tallac homes but was also the end of "Lucky" Baldwin’s resort. In 1920, Baldwin's daughter, Anita, closed the casino-hotel and demolished the buildings. Later that same year, Dextra Baldwin McGonagle, Baldwin’s granddaughter, constructed a beautiful single-story home on the family property. Today, the 2,000-acre Tallac Historic Site has picnic tables and several public beaches including Kiva Beach and Baldwin Beach. For more information, contact 530-541-4975.